The Philips CX50 ultrasound supports transducers that are specifically designed for abdominal and vascular surgical purposes, while it’s compact size and maneuverability makes it ideal for confined spaces. 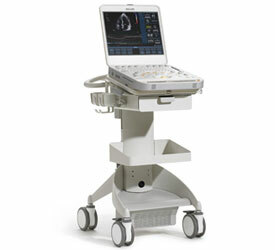 The refurbished Philips CX50 is considered one of the best-imaging portable cardiac ultrasound machines for sale. In addition to cardiovascular situations, the CX50 is found in any Point-of-Care situation where a physician is often performing the ultrasound.We like it for its ease-of-use and image quality. Its portability allows it to be an excellent system for needle-guidance procedures in MSK, vascular access, pain management, and surgical situations. Recent upgrades include a needle visualization packages and focus on surgical use (including new transducers designed for surgical situations).